00:30:00 Makes 5 servings, 1 cup (250 mL) each. Makes 5 servings, 1 cup (250 mL) each. 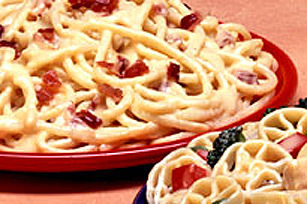 A rich and creamy sauce made easy with MIRACLE WHIP. Meanwhile, mix Miracle Whip and flour in medium microwaveable bowl. Gradually add milk, stirring with wire whisk until well blended. Microwave on HIGH 3 to 4 min. or until thickened, stirring after 2 min. Add cheese, mustard and hot pepper sauce; stir until cheese is melted and mixture is well blended. Drain spaghetti; return to saucepan. Add cheese sauce and bacon; toss lightly to coat. Prepare as directed using whole wheat or multigrain pasta. Serving Size Makes 5 servings, 1 cup (250 mL) each.